It has been only 9 weeks since the Bitcoin Cash hard fork, and we are again discussing another Bitcoin hard fork. What is a BIP (Bitcoin Improvement Proposal)? And for those of you who aren’t aware of the upcoming Bitcoin hard fork, pay attention. In this article, I intend to cover everything you need to know about the upcoming Bitcoin hard fork and how to prepare and benefit from it by doubling you coin holdings. Some of you may think this is a good thing as your value will also double! 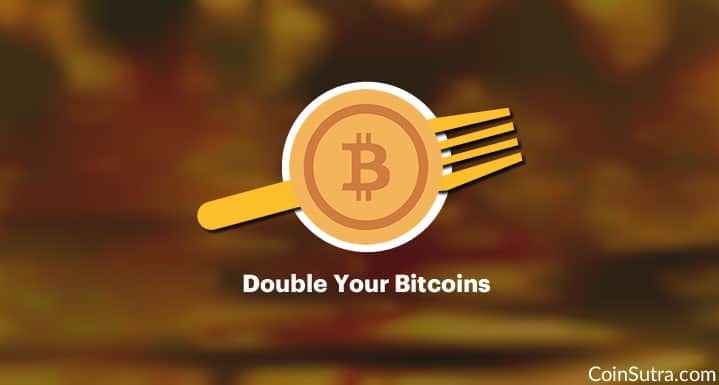 Note: Doubling of coins does not mean doubling of value, because after a hard fork, the value of both versions of coins are determined based on user sentiments and demand/supply in the market. Bitcoin Gold is a new, would be cryptocurrency denoted, as of now, as BTG or “bgold”. It will be a fork of the original Bitcoin that Satoshi Nakamoto invented in 2008. At present, there is very little information available about the technical know-how of this fork because their website is under development. Who Is Doing This Fork And When Is It Happening? The Bitcoin Gold project is being driven by some developers, miners, and their head Jack Liao, the CEO of the Hong Kong-based mining equipment manufacturing company, LightningAsic. Bitcoin Gold is also a real blockchain to pilot Bitcoin upgrades. As per their official website, the exact time is not yet known for this fork. But the official date for the fork is mentioned as 2017-10-25 (25th October 2017) but better to follow the block height which is block 491407. This is a community-driven hard fork without any consensus voting. It is primarily being driven by a few who believe that the original Bitcoin mining system has become centralized and is monopolized by a handful of mining companies. They believe this because of ASIC miners which provide a very strong entry barrier for an average user or miner like you and me. And now, these hard fork supporters want to change that and make the process more decentralized. How Do BTG Supporters Want To Change This Centralization Problem? BTG (i.e. Bitcoin Gold) advocates have decided to solve this problem by forking Bitcoin on 25th October by changing its original protocol. Specifically, to combat the mining centralization problem, the BTG developers are implementing a different mining algorithm altogether that will be resistant to ASIC chips called Equihash. This will make ASIC miners irrelevant for mining Bitcoin Gold because, with the implementation of Equihash, Bitcoin Gold will be mineable simply by using cheap GPUs. Note: Currently, Bitcoin uses the SHA-256 mining algorithm (read about SHA-256). Their other agenda is to save Bitcoin in case something happens to it in the future, as they claim will. Also, I think they want to compete with other GPU minable cryptocurrencies like Zcash, Ethereum, and Monero. And with Ethereum moving to POS consensus, this is a kind of masterstroke for this Bitcoin-branded coin (BTG) because then those Ethereum mining people will have to switch to either BTG or Zcash or another GPU minable currency in the future. But they know that they are not competing with Bitcoin and Bitcoin Cash as stated by their lead developer in a conversation with Bitcoin.com. BTG will be based on Equihash so it will be GPU minable. BTG will have inbuilt replay protection because it is a direct fork of BTC. And looks like BTG will have a pool of pre-mined coins for 16,000 blocks. Apart from these, there will be no changes like block size adjustment. And BTG will be following the suit of the original BTC core developers for the future betterment of their coin because they believe that’s the secure way. It’s a good idea to have a GPU-minable algorithm. This will surely prevent centralization and currently, there is no GPU-minable Bitcoin hard fork. So it’s good in that sense. On the other hand, their development and way forward look depressing. There is literally no information whatsoever on their GitHub or official website. Moreover, on GitHub, none of their developers are publically available. Also, haywire information sources on the Bitcointalk forum raise massive red flags about their future and their intentions. I was really surprised to learn that they might have an ICO for these pre-mined blocks, but again, there is little clarity about it on their official website. But… let’s say that around 25th October they have beaten all odds, clarified the much-needed information about their project, and we have a fork… then what to do in that case? Then the only thing to do is enjoy and claim your free airdropped Bitcoin Gold coins! Confession: I am going sell some part of BTG immediately (if a fork happens) and will HODL the rest of it. One month until #bgold exodus fork. After the BTG fork, you need not do much, but you need to be updated and agile about this subject. You should have your private keys. You should avoid being replay attacked. And here’s the important part: Both of your coins (BTC and BTG) will have the same private keys. Moreover, due to this fork/split, another problem called Replay Attacks can happen. Though, they say that they have replay protection in place, but we are not sure how effective it is as it has not been tested live. Avoid transactions for some days until the dust settles to avoid replay attacks. Keep your Bitcoin private keys with you, not in a third party exchange like Coinbase. Use hardware wallets like the Ledger Nano S and Trezor. Last time, during the Bitcoin Cash fork, these two hardware wallets were the first to support the forked coin. If you hold your keys in a paper wallet or software wallet, wait for instructions on how to access your BTG coins. The future of BTG isn’t clear yet. But if the fork happens, BTG will likely have some market value and will definitely steal away some hash power from GPU miners. On the other hand, we really need exchanges and wallets to support this Bitcoin Gold fork; otherwise, it will have a hard time finding any value. And as the fork time approaches, I will keep updating this article will more information on Bitcoin Gold and which wallets/exchanges are actually supporting it. Last but not least, don’t fall prey to fake websites/wallets demanding your private keys to let you access your BTG. So until that time, stay tuned to CoinSutra to keep up with the Bitcoin revolution! Update 1: Bitcoin Gold’s Website is Live. Read their FAQ section for more details here. Update 2: Bitcoin Gold’s Roadmap announced here. Update 3: Read BTG Dev’s Official Statement here. The Bitcoin Gold dev team is not holding any information back. We are committed to full transparency. provide all the needed information for the general public. is still a lot of work to be done and we will give all the support if there are people who want to help us. Bitcoin private keys secure in your own possession, as we don’t want any Bitcoin holders to miss out. You can transfer your BTC after the fork in October. Hi, I trade on Zebpay and have my Btc there. Would it suffice to leave it there for the free BTCgold, or, do I have to move it to a wallet. In that case would Unicoin wallet do or, can I use Copay wallet? Thanks for helping out. Move it out to a hardware wallet, Mycelium wallet or Copay (if they provide your seed keys). Thanks Sudhir. I missed the BTCGold fork. Shall use your advise for the segwit fork. I have some litecoin in my wallet. Did you recommend sell my litecoin and buy bitcoin before the fork happens ? I don’t recommend but if you want more BTG then you can do that. Some are already doing it. How much will you sell of the BTC gold and how much will you keep? Where can we sell the BTC gold? Do we need to be fast to get a higher price? I will publish a post on where to sell BTG. I will not be able to publish it before 25th because anyhow you won’t be able to sell it before 1st November. I may sell half of it if got a good price. What are your thoughts on storing on COPAY wallet, they did eventually give BCH? You can keep on Copay but now the fork’s snapshot is taken. So if you transfer it to Copay now you will not get BTG. Hello, I just downloaded Mycelium but I don’t see where is the private key. Where can I get from there? Everybody was saying it will forked on 25th October, but it has already been done on 23rd October. Probably short after you have published the article. True the date was 25th October but the block height was 491407 so it was reached yesterday night and a snapshot already taken. Block 491407 already reached and just withdrew to wallet from exchange. Have I missed out?? If your transaction made it to blockchain before block 491407 then you will get otherwise you missed it. hi there, i’m having my BTC in Polonix, would the BTG fork happen there too? or i need to transfer to blockchain wallet? Seems like Poloniex will not entertain BTG fork. Will update here if something changes. Hi all, Today I received BTG equal to BTC in my yobit exchange wallet. I am still waiting for blockchain.info BTG worth for BTC. I think still there is no update on BTG official wallet to import blockchain.info btc with the phrase. Please update if there is any. Your blog rocks. I keep getting up to date information. Thank you. Happy to know that you received your BTG. Blockchain wallet may or may not support it immediately and moreover, you won’t able to access BTG on your wallet before 1st November in any wallet as stated by BTG dev in their statement. So you can’t actually access BTG on a wallet now. Will publish further instructions soon. Everywhere I read that one need to keep their BTC wallet private key with them at the time of fork to get BTG. Assume that I had 1 BTC in my wallet(and private key) at the time of fork and if I convert the BTC to buy ETH or LTC would I still be getting 1 BTG at a later date? or because I used the BTC to buy other crypto coin, I would not be able to get equivalent BTG? To be eligible for BTG you just need to HOLD BTC at the time of fork. After the fork you can do whatever you wish with your BTC and you will still get BTG. Ohh! I totally forgot about the fork! The exchange holding mu funds doesn´t support Bitcoin Gold! When is the time limit to transfer it to a wallet that I hold the private key to get the gold? @Daniel the time is over and the fork is done. I have my BTC in gemini exchange. I am in process of transferring them to Trezor next week. Gemini has mentioned that they would allow withdrawal of BTG just like they allowed for Bitcoin Cash even though they do not support it. What do you recommend I should do? Will I get BTG? @Raman Considering what Gemini is saying is true and considering that you had BTC on it a the time of fork you should get your BTG. Anyways the fork is done so you can move around anywhere. What are the Indian wallets support Bitcoin Gold? No one as of now. I have BTC in localbitcoins, i can get BTG or not? I highly doubt that and there is no confirmation as such. How can we clain BTG? Also, just need to know which is the best site for trading in bitcoin..I have visited poloniex and found it good but need to know if there are any other good sites with low fees. Also, need to know is trading on poloniex trading legal in India? Claiming BTG is still not clear. Wait for some time will publish instructions soon. Regarding legality, there is no such rule as of now. So its neither illegal or legal as per the current law of the Indian land. Try Binance exchange for cheaper fees. Very informative post. Enjoyed reading it. I have my BTC in Exodus. Should I just wait until after the SegWit2x fork to claim my BTG? I have held BTC in blockchain.info wallet during the hard fork. As per your article, I believe the hard fork is completed and BTG is already credited to blockchain.info wallet through a snapshot on BTC blockchain. Now that, I want to move all of my BTCs to buy other altcoin. Please advise if I can still get BTG if my balance of BTC is zero in blockchain.info wallet. Yes you can transfer your BTC anywhere now as the fork is done. THANKS FOR ALWAYS BEEN THERE FOR US @ SUDHIR KHATWANI …..I LEARN SO MUCH FROM U.. Regarding genuinity- we don’t recommend such sites to earn BTC. Check our article of some genuine ways of earning BTC. Another thing if they are allowing you transfer your BTC then you can transfer it to Zebpay or Unocoin and convert it into INR. How do i claim my btg on mycelium… I’m confused? any announcement regarding bitcoin gold. How can we claim it? I had a BTC at Exodus on October 15th. I plan to keep it through two hard pork sessions (BTG and segwit2x). I hold the private key and 12 backup keywords. However, in the latter case Exodus does not support the claim of both BTG and Segwit2x, while I only use the private key one time for importing claim into another wallet. How can I claim both BTC and B2x with only one private key? I had my BTC on a paper wallet during the fork as suggested. But I don’t know how to claim it. Should I transfer into some other wallet? Import you key in Coinomi wallet you should be able to see your BTG if you had BTC at the time of fork. Or else wait for BTG to release their official wallet. Which wallet’s seed did you try? Not sure what’s wrong because I am able to see it in my wallet. Maybe a quick question to Coinomi dev should throw some light on this. Watch these videos to learn more and subscribe to our Youtube and Blog that will help you. Is there a chance to get bitcoin gold now? Hi if you had BTC at the time of BTG fork then you will be able to claim BTG. Hi, I have downloaded the updated version of coinomi and follow the steps but value of bitcoin gold is showing as zero. Is BTG block chain live? Please check if you had BTC at the moment of the fork in the wallet that you are trying to restore it Coinomi. Because if you had then you should be able to see your BTG, like others who have confirmed that they are able to claim BTG by this method. Having this same issue. I can see my BTC balance but no BTG. Also it still wont accept my Mycelium private key. Can you post a new step by step guide…? did you try importing the private keys or seed word from mycelium to coinomi? Were you having BTC at the time of fork? Did you enable BTG and added BTG wallet, its available in the lastest app? I was told it wasnt yet live man… Miners gotta mine. I have Bitcoin Cash (BCH) in my BTC.com wallet. Heard about a hard fork scheduled for around 13th November. How to claim the new currency coins in case of a split ?? I asked you for the Bitcoin cash (BCC/BCH) not the Bitcoin BTC which is still happening as I believe. So would I be able to get the BitcoinABC. I am using BTC.com wallet & how to claim it ?? No you can’t claim as the Bitcoin Cash fork has not created some other coin. Hey Sudhir! I had (still have) my BTC stored at a bitpanda wallet. They already said they will not support BTG, so is there any possibility to receive those BTG? I think bitpanda is a hosted service which keeps your keys. So if they have denied BTG support then I believe you will not be able to claim it until they give you the private keys. if i bought BTC after 25 october ,do i get free bitcoin gold ? I am a newbie here. I was searching google for howto and whereto started as I wanted to buy some Bitcoin-Cash and Bitcoin-Gold. As I see you have spent a lot of time and give out your knowledge to others. I am wondering if you can step by step showing the best way for me to buy some of this stock. Im in the United States and have not had any experiences trading at all. Greatly appreciated any of your helps here. i received btg in my coinomi wallet but whenever i try to transfer it to any exchange like yobit or hitBTC it says that the deposit for BTG is currently unavailable. the coin officially launched yesterday. what should i do? Τhe Bitcoin Gold team is currently having difficulties bootstrapping the $BTG blockchain. Once these issues are resolved, #BitcoinGold will become available to all #Coinomi users who will then be able to store, send, receive and trade their BTG without any further action. I use bitcoin core and am technical. I’m uncertain how I should proceed to claim the eq of btg with my btc wallet from bitcoin core. Do you have any info on what I should do? I have the wallet’s .dat and the current encryption string. Bitcoin Gold Core wallet is here. You can use that. There is no instructions how to access BTG in your article, just speak around. Appreciate your comment but when I wrote this article there were no actual coins to claim. I have created a trading account on Binance per your guidance and started trading on it. But today, when I checked my deposit/withdrawal window I can see new coins named “TRON” showing on my window. I haven’t done any trading on these coins but still it is showing a balance for these coins. Can you please confirm if I got these coins as free ? Also, I have one more doubt that I purchased some ETH then sold all of them at higher price but it is still showing some balance for ETH on deposit/withdrawal window. I don’t know why it is showing balance as I have sold all the purchased quantity. Is the balance represents profit earned ? I think I missed your previous comment. How much is your ETH left exactly? Against which pair did you sell your ETH? I purchased ETH against BTC. I purchased .05 ETH @ 0.044800 and sold all of them at 0.048001 and current balance in ETH is 0.0009500. Same thing happens with other currency too I purchased Bitcoin cash and sold all of them but after selling them they are still showing some balance. Now I have balance in 3 currencies on binance (BCC, BTC & ETH) and I need to withdrew all my funds from binance. Can you please guide me how can I convert them in rupee ? It’s working, I transferred 1BTC, and received 2BTC in a week. Before the Fork I had my Bitcoins on Kraken Exchange. Today I transferred my BTC to my ledger Nano S. I have installed BTG app on my Ledger Nano S and did a procedure on one of the Youtube videos for the BTG split tool. There are zero funds in BTG (from Legacy) so I cannot transfer to the Segwit BTG app. How do i claim BTG, THANKS! This process works if you already had BTC on Ledger Nano S.
Transfering it from Kraken won’t do, now you need to wait for Kraken to support BTG. You should take advantage of the Cryptocurrency opportunity and join the new digital millionaires. Double your Bitcoin in 24 hours with BTCX3, and get a subsequent weekly payout of 0.1 BTC for 8 weeks. I got my Bitcoin doubled last week and I got my first weekly payout already. We have to wait and watch if these forked coins will be supported or not. Developers from Ledger/Trezor team will audit the code and then will decide based on code + market demand. Hi Sudhir, I’ve noticed on BTG website it states GDAX as a future exchange. Not long ago Coinbase blog said it was not considering BTG. So this is a recent change on the BTG website ( within the last 2 weeks). Do you think this means that it will soon be listed on GDAX/Coinbase? What is your opinion? Thanks. GDAX isn’t supporting it I believe. It might be a wrong info or old info on website. you will get b2x in 1:1 ratio.